It was 1979 and I was 10 when I shared my bedroom with my 2 older sisters. Once in a while my brother moved in, too 😯 . We each had our own little nook to do what we wanted. My nook was neat, organized, fully decorated top to bottom (not joking). My sister’s nooks…not so much. Sometimes when they were out I would sneak over to their nook and fix it up. I would make their bed, re-organize their bedside table…sometimes I would even move our beds around. Yah…it was crazy. I mean, who does that at 10 years old? The thing is, I’m still doing it and I’m 47. Only now, I give the nooks titles and write about them. My current nook is called…my “DIY Kitchen Coffee Lounge” and I’m leaving my sister’s beds behind and sharing it with you today! 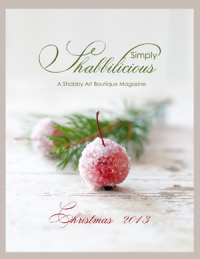 I also happen to be joining some talented blog friends for an organizational blog hop. I’m an organized freak, so when they asked, I jumped. 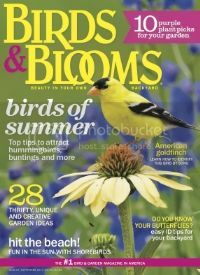 Only this time…what I’m sharing may be a little bit different than your usual organizing project. You see, it’s all about organizing FURNITURE so it’s more functional for your family’s needs. What it came down to, is that I grew tired of the kitchen table taking up the prime location in our kitchen next to the fireplace. I mean seriously, this is the hottest spot in the house and I mean that in more ways than one. 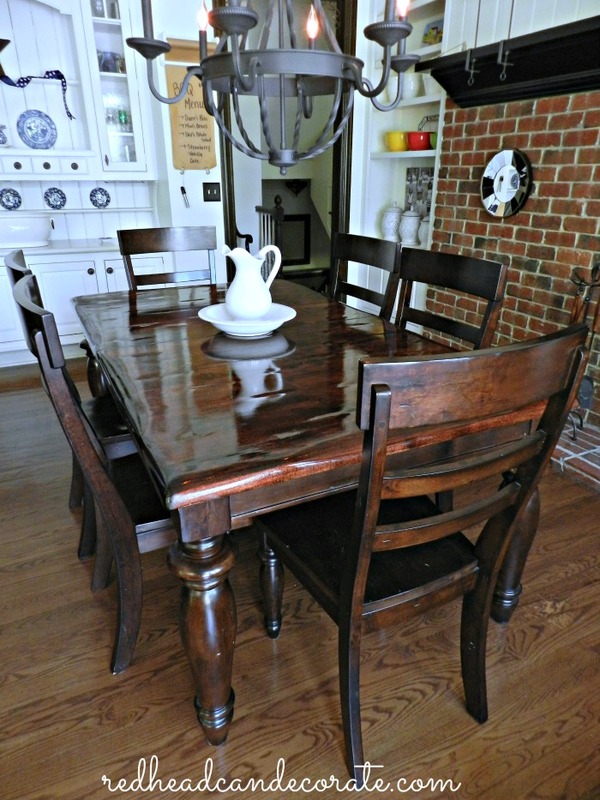 Although we love the table and worked very hard refinishing that table top last Summer, we needed a change. It’s really hard to sit and get comfortable in front of the fire at a table, you know? I mean, this is where it all happens. We cook, bake, burn turkeys, eat, work, watch movies, read, talk, relax, play Monopoly, play with our cat, argue, cry, talk on the phone, laugh, have family meetings, do homework, drink wine coffee, all in this spot. There was one problem, though. That damn table was in the way. Ahhhh…once it was there, I knew it was a great fit. I love how the windows show off the shape of the farm legs and we can eat while looking out at the lake. Okay, so now I had to figure out where to put my leather sectional that use to be there. 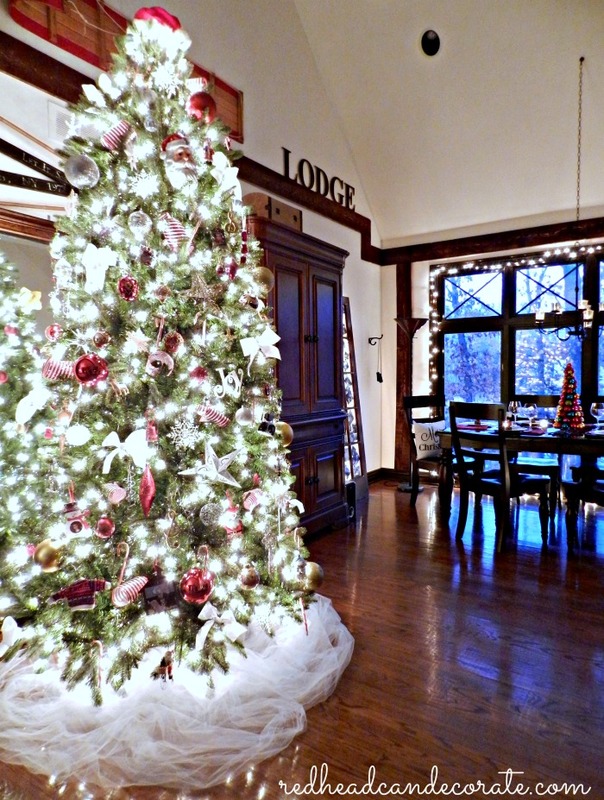 The tree was up during this fiasco too, so that made it a bit weird, but we got through it. What do you think? Take look…have a muffin. The kids were ecstatic. Jumping on the sofa, singing Christmas tunes, it all seemed so perfect. Why the heck didn’t I do this before? Honestly, I think we are all just so wired to think that we need to follow certain rules with furniture placement. This is proof that we do NOT. Then I got to thinking even more. This seemed more like a “Coffee Lounge” to me. 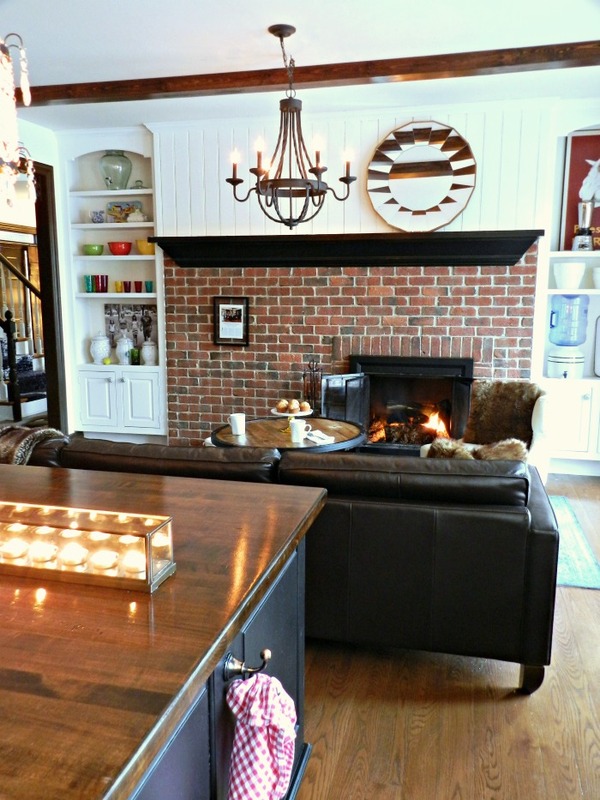 My husband & daughters drink ALOT of coffee and the coziness of it all just makes me feel like I’m in a coffee lounge. All it needed was a cool COFFEE sign, so I looked on Etsy and found this amazing family operated company called Ragdoll Annie’s. The price was right for a custom sized farmhouse style coffee sign and Ann was extremely helpful with all of it. The sign was shipped quickly and is beautifully crafted. In fact I’m going to order another sign, soon. So, if you need a custom sign, or want to shop their’s, I would check them out. Our rustic industrial coffee table fit in beautifully because it is large enough for us all to eat here, and the kids can do homework, and I can even blog. The table also cranks upward so it’s not so low. 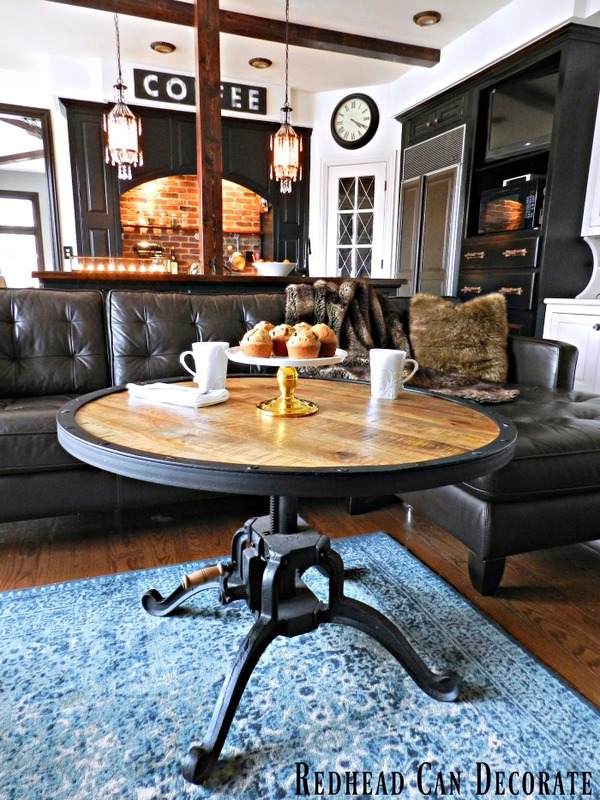 If interested you can find this table here: Industrial Adjustable Coffee Table. Here’s the table now. If you look closely, you’ll notice little imperfections in the top of the table. Love those little touches. Oh, and I also brought the rug in for more coziness. 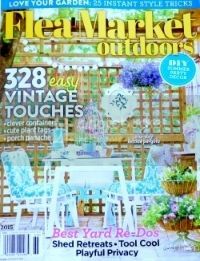 You can find this blue rug on-line HERE. This is absolutely everyone’s favorite spot in the house. 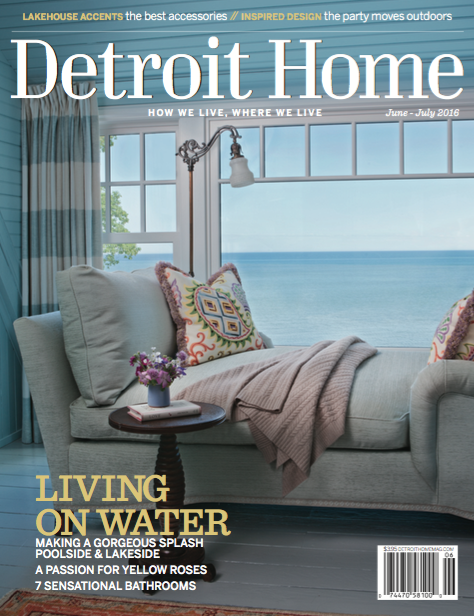 The heart of the home is BOOM, right here. You can see here how we hooked our light fixture chain up to the ceiling so we didn’t bump our heads on it. Here’s a similar light fixture I found if you’re interested: Rustic Iron Light Fixture. That’s really all I had to do to transform this space. Good bye big bulky hard table, hello soft cushion-y sofa. I should note: the one thing that bugs me is when my teens go over the back side of the sectional. Kind of like they are getting into a convertable 😎 . Oh wait…don’t go yet. You want some coffee? 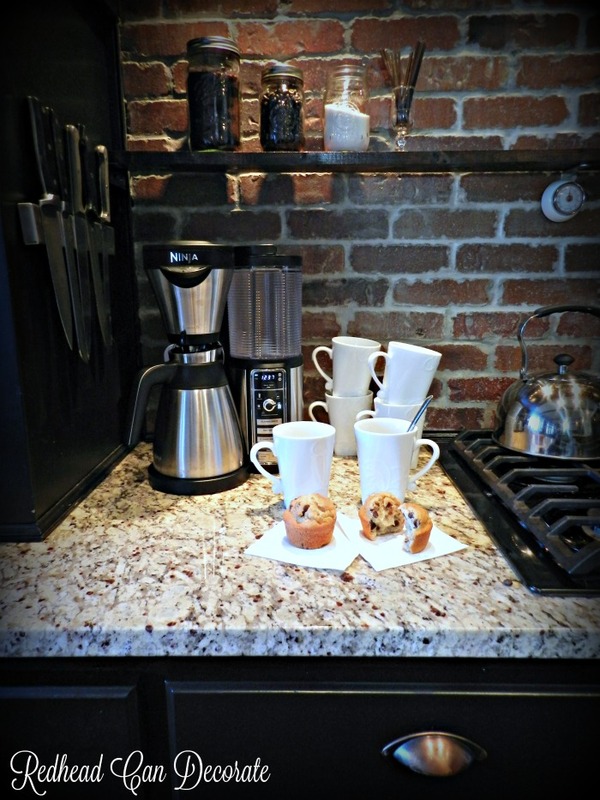 Check out how I organized up a little coffee station under the coffee sign. Oh wait, that was before. Let me whip a pot up in this Ninja Coffee Bar I gave my husband for Christmas. He says it makes the best coffee he ever had. Even better than Starbuck’s. It can make cold coffee drinks, too. It’s pretty cool and blows our Keurig out of the hot tea water. Here’s where I found it: Ninja Coffee Bar (it has great reviews). Just by chance, my sister in law just opened up her own coffee cafe and roasts her own coffee beans. We order it on -line because we are in Michigan, and she is in NY. You should definitely try her coffee. We grind our coffee beans fresh using this coffee grinder. 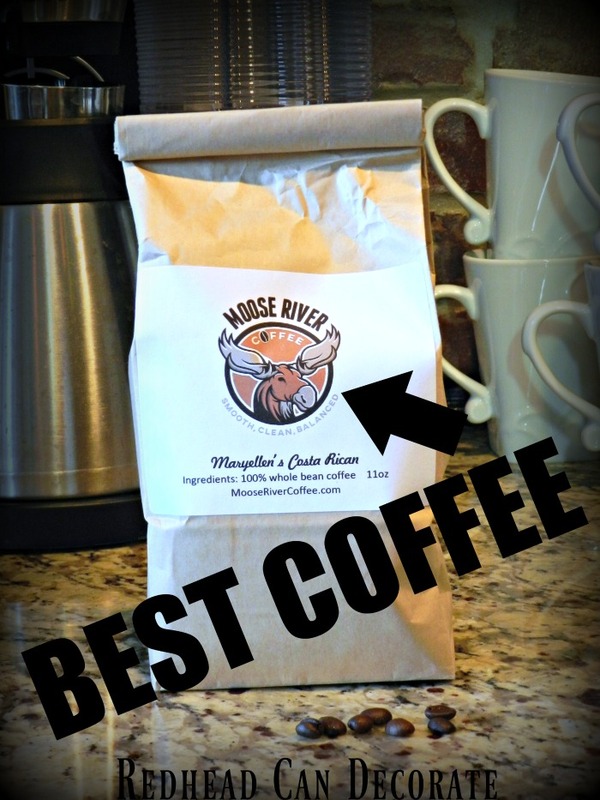 Order Moose River Coffee HERE. So yes, organizing furniture is a thing. 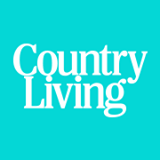 Don’t let anyone tell you where you should put what when it comes to your home & furniture. You know your home better than anyone, and you are the one that lives there. Place your furniture how it suites you and your family the best. Don’t be afraid to think outside the room. If you need help with that, just let me know HERE. Neat, You did good, love, Dad in NewYork. Thanks, Dad in New York! I know how you love your coffee! I love to see your dad’s comments! Is there a different Dad not in New York? Was eerie reading about your tidying up after your sisters. Did the same thing when I was young. Loved this last project. You are definitely on a (decorating) roll. You go girl! Way to break the rules! I love the sofa in the kitchen. My kids would be so excited if they were allowed to sit on the couch! What a great switch! I agree with you– it is so fun to switch furniture around for a different perspective! Hope you’re having a great week, Julie! Kristin-Totally like Jan Brady did…or was it Cindy? Thanks for stopping by, girl. 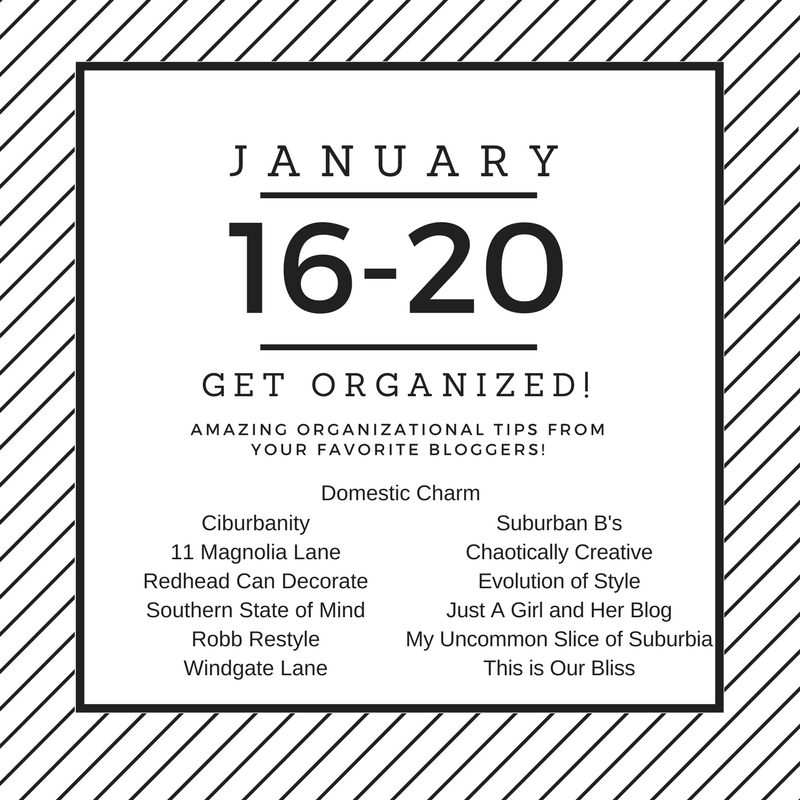 Can’t wait to see your organizing! Oh wow! 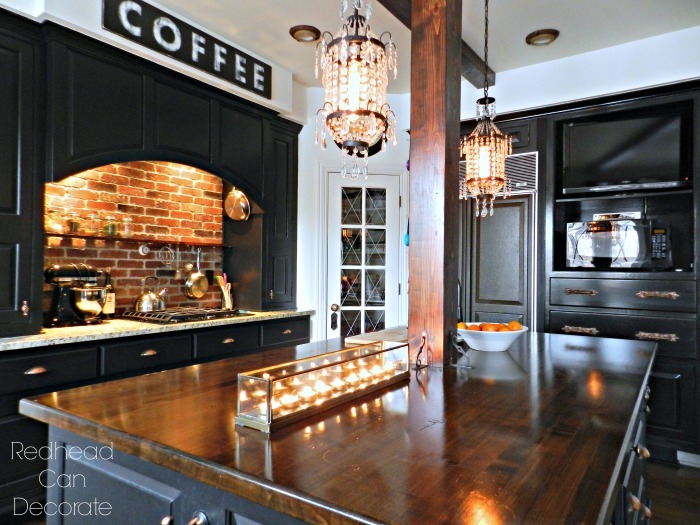 I love that little coffee area! How fun to have a little alcove like that to set it up in. Also love everything about your new set up! We did something similar except with overstuffed chairs! The dinette area in the kitchen was so small that we just made it a seating area instead. 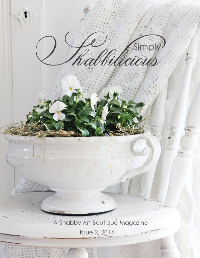 LOVE IT!…Warm, cozy, and very functional. Style should be fun, and it’s also personal….so do what you love, and enjoy it! What a wonderful spot – close to the kitchen so when you (or who ever is cooking) can still be involved and in front of that fireplace…..what’s not to love. My daughter turned us on to Nespresso coffee machines. It makes the best espresso or lattes or iced coffees or whatever makes you happy. SWEET! I love what you have done! 🙂 And, seeeee, all that practice has made you great at what you love to do!! Wow Julie, looks great and LOVE the sign. Wrote down the name of the shop for the sign. I think I might be crazy rather than brave, lol. Thanks for stopping in, Cindy! LOVE this!!! Just got a wild hair and switched my living room and dining room. Husband just gave me “that look” when I suggested it. We all love it!!!! Love your blog. That is hysterical, Wanda! I know that LOOK well. I love this!! 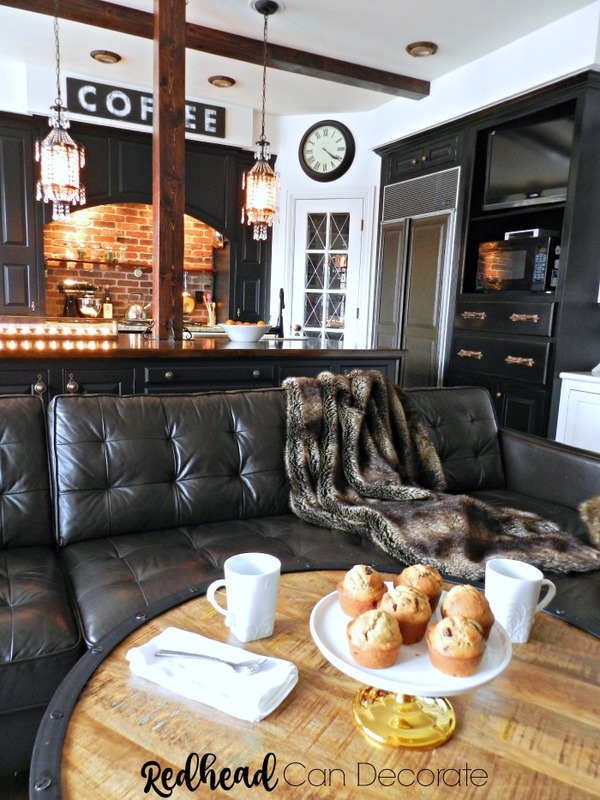 Wow, I can’t believe how amazing that sofa looks in the kitchen – such a cozy, perfect space for coffee and homework! I’m also a little jealous of your ninja coffee maker!! yummy! Brilliant!!!!!!!!!!!!!!! 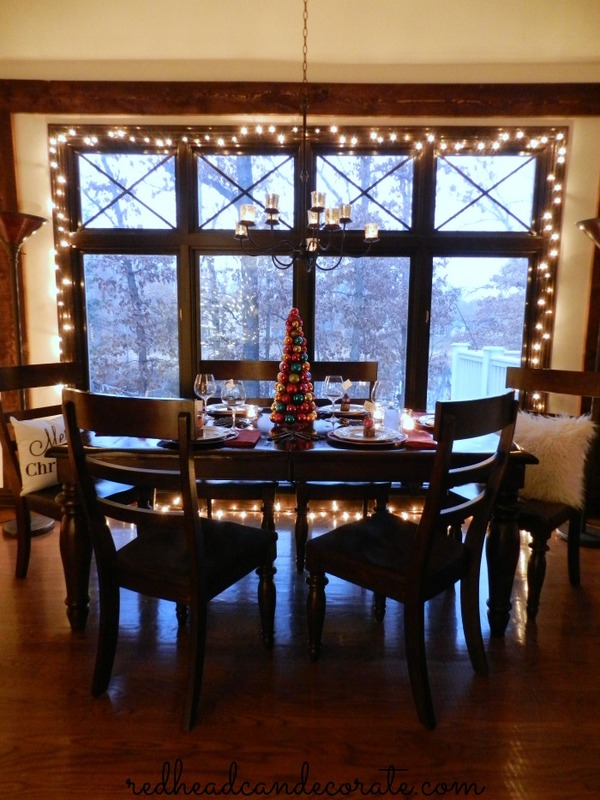 Love how your kitchen looks, and the fireplace arrangement.. and also how the table looks by the window. love,love,love, can’t say it enough. Love it! I wished I had the room in my kitchen for a sofa. I would say it’s a perfect fit! Love where the table and sofa ended up and bonus that the family loves it! You are such an Inspiration. Although Its just my little boy Josh, Mr. Oliver, the Persian kitty your ideas and swaps are great! I live in an older home in NYC and can do all the repairs at once. I ve learned that with the your great ideas, and swaps I get compliments on the decor and furnishings never having to stress what people think about these old walls. I truly couldn’t do it without you. Hi Melissa, Did you figure out your bathroom walls yet? Spectacular and thanks for the giggles! 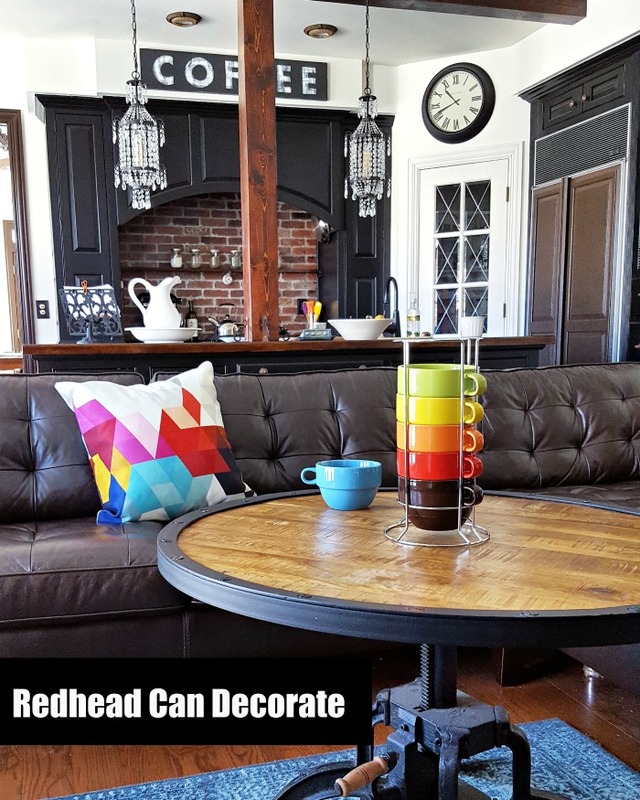 You truly do have the right title “redhead can decorate”, because you always show us so many beautiful ideas and so many fabulous designs of that brilliant creative mind of yours. Thank you my friend. Not many people would be brave enough to try this, it really shows imagination and talent, love, Your only Dad, and I do live in Buffalo NY. FANTASTIC… I would never leave the couch… I luv to sit by the Fire !! Without a doubt the most brilliant move ever! Our kitchen and family are run together so we sort of have the same vibe. If I am in the kitchen cooking the family is right there to converse in the FM. I absolutely LOVE this Julie. I love coffee too btw. Thank you, Debbie! You must try this coffee! You won’t regret it. It’s a great price for what you get, too. Straight from upstate NY! Thanks for stopping over girl! I love the switch! It’s so cozy! I love it and wish I could still switch things around. 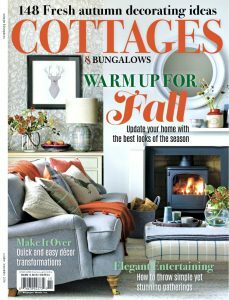 I used to do this seasonally and my husband quietly over the years replaced our furniture so I couldn’t do it anymore. It is too big and bulky. I will live vicariously through you! Oh, one squirrel caught and released somewhere else, two to go then we can fix the hole they chewed their way in. I really enjoyed this post. That’s was you call thinking outside of the box. I love coffee ☕️ and my sectional. I wish I could do this. No room to swap but I’ve been thinking about removing my window seat and putting in a sette. Guess who just gave me the push and courage I needed..love love love your blog. Oh my gosh, I love this so much! I need this in my space! Crud, i need new furniture now ;). I got the Ninja coffee bar for Christmas and I agree, it makes fantastic coffee. I am also wasting less coffee when it is just me at home (hubby drinks the office coffee during the week). Oh, and I half-expected to see Ross and Rachel and the rest of the gang sitting there! I Love it! I even love the fact that your teens fly over the back of the sofa 😉 I used to have a teen who did that! Now he’s a dependable married man with a little more respect to the cost of things. Good for you. Looks great. I’m thinking of making my family room into the dinning room and the dinning room into the family room. Scares me! Now a few days after reading about your change I visited a new furniture store ( Blended) here in Muskegon, Mi. I was shocked when I spotted your round coffee table. Priced under, $400.00 ! Hi Julie! ~ Sorry I am a week late from commenting on this blog, didn’t have internet access this last week & I missed seeing your creativity! 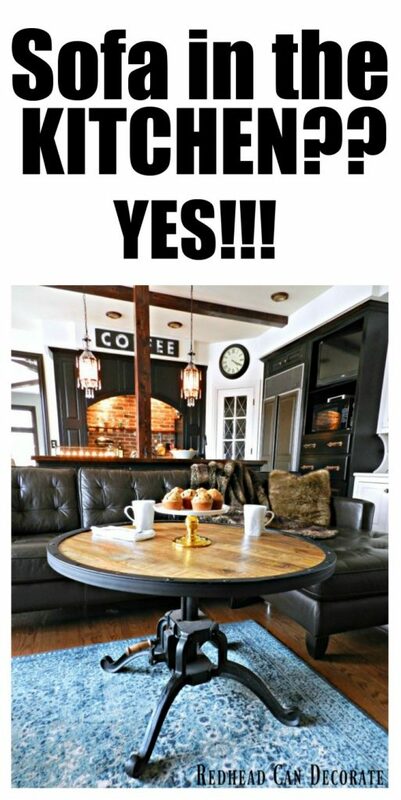 ~ I think we all agree your dining room/couch area is fantastic! Sucha warm & cozy spot to lounge & have fun with family & friends! ~ My family are hot tea drinkers in the winter, but your charming sign ties it all together ~ Café Ole’! Julie…..Me too, about coffee. I love the different smells of coffee, but coffee makes me jittery & sick to my stomach…. 🙁 ….my Mom & sister love the dark teas…English Breakfast, Tetley, Constant Comment. I love the herbal fruit teas, a lovely Asian rice tea, & have you tried Lady Grey by Twinings? It is a lighter version of Earl Grey & so delicious…..I highly recommend it! Hi Kaye! They were on clearance at Pottery Barn about 7 years ago. I was thinking of doing the same thing just last night! Wow i love it. Your home seems perfect now. Such an inviting area. I love it and the addition of the blue rug is a good soft touch. 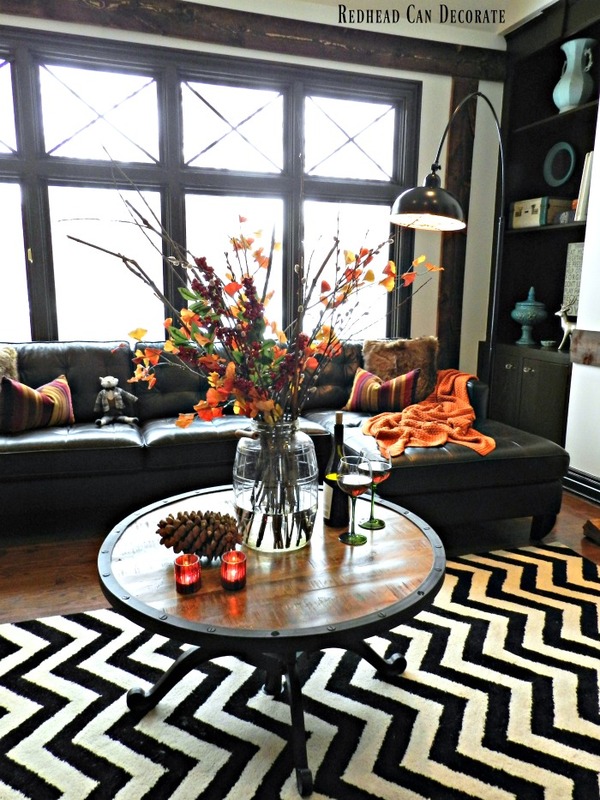 I thought I liked the zebra rug as an accent until I looked at the next photo. The blue, being softer, just improves the area for conversation. The move of the table was also a good decision. Rainbow color accents are so Julie. Do tell…do those same teenagers drink the milk right out of the carton from the fridge just to drive Mom crazy? Our son used to do that! That is so funny, Nancy. I don’t think they do, but I know their Dad does lol!! I LOVE THE SWITCH! BOTH ROOMS LOOK FABULOUS. 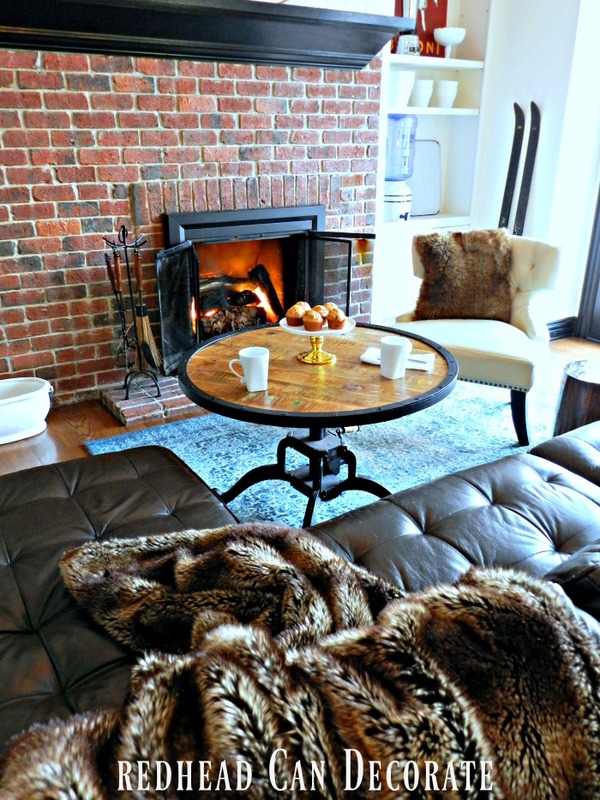 WHERE DID YOU GET THE BEAUTIFUL FAUX FUR THROW? KEEP UP THE GREAT DESIGNS.